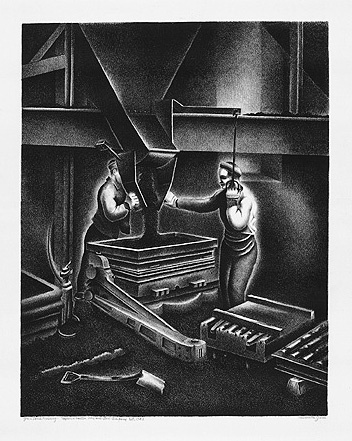 Green Sand Molding, c.1937, Lithograph. Edition not stated. Signed and titled in pencil. Annotated by the artist Taylor-Wharton Iron and Steel Company Est. 1742 after the title. Image size 15 3/16 x 11 7/8 inches (386 x 302 mm); sheet size 22 7/8 x 15 15/16 inches (581 x 405 mm). A rich, black impression, on cream wove paper, with full margins (1 7/8 to 4 inches), in excellent condition.